The year is 1973, and in Studio One, Dooraville, in Atlanta, Georgia, Ronnie Van Zant, the lead singer and guiding light of Lynyrd Skynyrd mutters ‘Turn it up’ into a microphone. An electric moment in a song that will become legendary, and which will propel the Florida band up the charts on its release in 1974. There is something unquestionably immediate about the song, its simplicity, and its energy. From Van Zant’s intro – a fortunate recording accident, he was actually telling producer Al Kooper to turn up the microphone in his headphone mix, while the tape was rolling – onwards it sounds like you’re there in the studio with the band, live in that moment. Indeed, the band would later talk about how quickly the song came together. 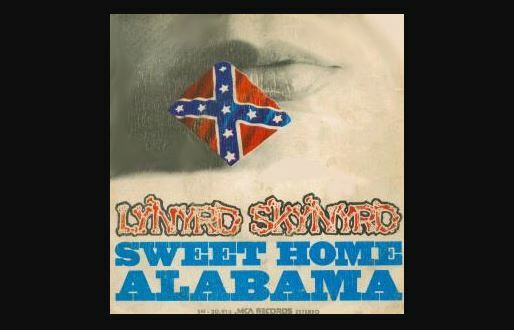 If Sweet Home Alabama captures a moment, then it’s interesting to examine what kind of moment that might be, given that it has become the musical equivalent of the confederate flag; for fans it’s a song taking pride in southern culture, for many others it’s racist overture, an anthem from and for a group of rednecks. To answer whether Sweet Home Alabama is a racist song, we’ll have to try to step into that moment, or in fact various moments. To set the stage, let’s take a step back, just a year, to 1972. It’s an election year – Richard Nixon will go on to a landslide victory against the Democratic Party candidate George McGovern, despite the developing Watergate story. Internationally it’s the year of the Munich terrorist attacks, the second Cod War between Great Britain and Iceland, and Bloody Sunday in Ireland. Atari launches its first video game, Pong. At the Oscars the best film goes to The French Connection (other nominations include A Clockwork Orange and Fiddler on the Roof), while the best soundtrack award goes to Isaac Hayes for the theme to Shaft. Then, just as so often happens now, there are no African-American actors nominated for the main prizes. The biggest selling album of the year, in North America, is Neil Young‘s Harvest. It’s Young’s fourth solo album, and will top the charts around the world. It has the massive hit single Heart of Gold, and critcally acclaimed tracks like The Needle and the Damage Done, and Old Man. It also has the track Alabama. In 1972 Lynyrd Skynyrd are a long way from legendary. They’ve spent years being rejected by virtually every record-label in the land, despite having been taken on by the legendary Alan Walden, who, with his brother Phil, has worked with Otis Redding, Percy Sledge, Sam and Dave, and a variety of other Soul acts. In ’71 the band spent time in Muscle Shoals Alabama, recording with the legendary Jimmy Johnson (who worked with Aretha Franklin, Wilson Pickett, the Staple Singers, and the Rolling Stones). In ’72, very much at the end of the road, the band accept a desperate record deal organised by Al Kooper (multi-instrumentalist who played with Dylan, Hendrix, and was a founding member of Blood, Sweat and Tears), who takes them under his wing to produce their first album in Dooraville. After years of rejection, years when their livelihood and reason for being is provided almost exclusively by touring across the southern states, playing on every stage – big and small – that they can manage, 1973 is set to be the make-or-break year for Skynyrd. It’s in this context that Ronnie Van Zant hears Neil Young’s Alabama. Alabama. What could it mean to a Canadian, like Neil Young, at the start of the ’70s. Just 17 years before, in a brave moment Rosa Parks refused to give up her seat to a white man, on a bus in Montgomery, Alabama. Alabama throughout the ’60s was a central stage in the civil rights protests that rocked America. It was also the state perhaps most associated with the violent backlash of white supremacists against this movement. In 1963 the Ku Klux Klan bombed Birmingham’s 16th Street Baptist Church; a crime which killed four young girls and injured 22 others; a crime which Dr. Martin Luther King Jr. described as “one of the most vicious and tragic crimes ever perpetrated against humanity”. It was just one of many bomb attacks by the Klan in Birmingham, to the extent that the city became nicknamed ‘Bombingham’. Alabama at this time is also home to one of the most infamous political characters of the civil rights era, Governor George Wallace. In his innaugural speech, in 1963, he famously declared “In the name of the greatest people that have ever trod this earth, I draw the line in the dust and toss the gauntlet before the feet of tyranny, and I say segregation now, segregation tomorrow, segregation forever”. It was Wallace who, as state governor of Alabama, ordered Alabama Highway Patrol Chief Col. Al Lingo to “use whatever measures are necessary to prevent a march”, when civil rights protestors organised to march from Selma to Montgomery in 1965. Whatever measures are necessary meant state troopers viciously attacking peaceful protestors in an event that would be labelled Bloody Sunday. In ’72 Wallace has had a bad year. He runs for the Democratic primaries, and is polling well when, on the 15th of May while campaigning in Maryland he is shot, by an attention-seeking would-be-assasin; the attack has nothing to do with Wallace’s political positions, but it effectively ends his campaign, and leaves him wheelchair bound and in pain for the rest of his life. He is, though, still a powerful politician – by 1974, in a profile by the Australian journalist John Pilger, he’s described as the most powerful man in America, because he still largely controls the Southern vote for the Democrats. Indeed in 1974, while Skynyrd’s Sweet Home Alabama is racing up the charts, as the first single off their second album, there’s still speculation about a possible Edward Kennedy / Wallace ticket for the presidential elections of ’76 (Kennedy certainly courted Wallace, appearing with him at the Spirit of America event in july 1973). And so, the stage is set. Let us return, to 1973. It’s june, a month after the recording of the first album,(Pronounced ‘Lĕh-‘nérd ‘Skin-‘nérd) has finished, and Van Zant has re-convened Skynyrd, with Kooper, back to Dooraville ‘s studio one, to record a song that he’s adamant will be a hit. Of course, one of the ironies of the song is that, while Skynyrd took umbrage about a Canadian lecturing them in Alabama, the band itself was from Jackonsville, Florida (with Californian Ed King providing the signature riff). It’s interesting then to consider why the band would choose to highlight Alabama. Was it a considered message, responding to the slight by Young? Or did it evolve into that? So, instead of Neil Young, we have O Susana, as a starting point, a song written by Stephen Foster for minstrel shows across the south, where African-Americans would be jeered and lampooned, though, to be fair, by the 1970s the song had lost much of that flavour, and had been covered jokingly by liberals like the Byrds and James Taylor. Of course, once chosen as a hook, in ’73 it’s hard to imagine Alabama, if you’re a musician, without Neil Young coming into mind. The funny thing about the Neil Young verse is that it’s the most commented on, but now least controversial of the song. It may have seemed gutsy, for an unheard of band to call out the #1 singer-songwriter in the world at the time, but in real terms it was a shrewd move which gave the song a powerful publicity punch to join with its rolling riff. And, as is well documented, Young took the song well, ultimately writing in 2012 that Alabama “richly deserved the shot Lynyrd Skynyrd gave me with their great record. I don’t like my words when I listen to it today. They are accusatory and condescending, not fully thought out, and too easy to misconstrued”2 (another irony here is that Young’s description could just as easily fit Skynyrd’sSweet Home Alabama). Alabama, in truth, seems anything but a stinging rebuke to the great Southern state. There’s a certain condesencion, certainly, but the song is softer both musically and lyrically than Young’s earlier angry outburst Southern Man, from the album After the Gold Rush. True, there are the references to ‘old folks tied in white robes’ but it’s far from incendiary. So the Skynyrd / Young shootout is a damp squib from the start, a diversion from the real guts of the song. And here lies the real controversy. What were they thinking, bringing up Wallace in ’73, in response to Neil Young’s accusation of racism and bigotry? In a song that lauds and identifies with the people (and it’s for you to decide whether that’s the white people, or all the people) of Alabama, it’s problematic – to say the least – to start with ‘In Birmingham they love the Governor’; at this point in the song we’ve been carried into the bosom of Van Zant’s Alabama kin, so are they the same kin that love the Governor? The most ambiguous syllables in rock history, that chime in immediately afterwards, do little to clarify things. They could, as Skynyrd intimated in various interviews later, be a kind of boo-ing at the villain of the piece, but equally plausible is that they are there to mock Northern Liberals who have a problem with Wallace. Sure, the next lines fit in well with the first reading, suggesting that while the South has politicians to be ashamed of, the North doesn’t have it better with ‘Tricky Dicky’ Nixon. Ambiguity in the era of dog-whistle politics gave Skynyrd the musical equivalent of Nixon’s southern strategy. 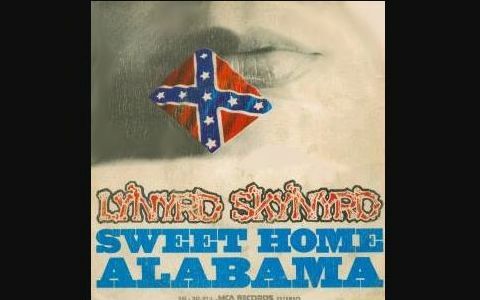 Sure, all the public expressions regarding the song suggested it was misunderstood, just as they would suggest that the symbolic Confederate Flag backdrop was a marketing gimmick foisted upon them by the record label MCA, but equally anyone wanting to pick up a defiant, white supremacist theme in Sweet Home Alabama could easily sing along. Complicate matters further, and skip ahead to the outro of the song, where as if to add insult to injury, Van Zant again seemingly sings Wallace’s praises. If Edward Kennedy was willing to court Wallace in 1975, was it so bad for Van Zant to repeatedly namecheck him in 1973? Did it mean support for segregation and racial supremacy? It’s impossible to go that far. Let’s take another look at the Governor. Wallace, who to this day remains a symbol of of White Southern intolerance. Wallace actually started out as a relatively enlightened public official. He served as a judge in Alablama, and was known for his relatively tolerant treatment of African-Americans in his court. During his first race for the Gubernatorial primaries in 1958 he declared: “I want to tell the good people of this state as a judge of the 3rd Judicial Circuit, if I didn’t have what it took to treat a man fair regardless of his color, then I don’t have what it takes to be the governor of your great state.”6 He lost the race to the KKK endorsed Attorney General John Malcolm Patterson who stood on a pro-segregation, law and order ticket. Famously Wallace complained to his finance director, Seymour Trammel, “I was out-niggered by John Patterson. And I’ll tell you here and now, I will never be out-niggered again.” 7 So Wallace started out as, by the terribly low standards of the time, primarily indifferent to African-American civil rights. 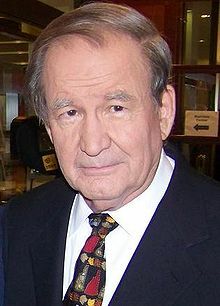 He assumed the mantle of strident segregationist for political opportunism. Opportunism and indifference were, perhaps, the guiding principles when Van Zant and Skynyrd wrote the song. Wallace had worked out that, to get elected in the South, you had to appeal to racism, and he was fine with that. Skynyrd by ’73 had worked out that a very specific type of ‘Southern Identity’ in their music could, not only keep their local fanbase happy, but also catapult them on to a national stage. They may not have been racist in their intent, but who can tell? One thing is for sure, though. They sure as hell weren’t opposing racism in the song. If you were to cut out the opportunism of picking a fight with Neil Young, and basking ambiguously in the glow of Wallace, what remains seems like pure gold. The song’s final verse gives you an earthy, soulful tribute to the Rick Hall’s legendary Muscle Shoals backing band, the swampers. Skynyrd at the start of their career, in 1970, had gone to Muscle Shoals to record an album with Jimmy Johnson of the Swampers producing. Muscle Shoals in the ’60s became famous as a rare place in the segregationist south where, in the privacy of the studio racial divisions became invisible. The unique atmosphere of the studio, and the talent of the (all-white) swampers attracted names like Wilson Pickett, Aretha Franklin, and Etta James to record there. Van Zant was certainly caught up in the romance of the place, ambitiuosly studying everything that Johnson and the swampers did in the studio. Skynyrd’s then manager Alan Walden claimed later that it was in Muscle Shoals that the band learned how to record. Their recordings in Muscle Shoals though were anything but succesful, with at least nine record labels turning them down. Walden recalls in Mark Kemp’s Dixie Lullaby: “we got turned down by nine different companies, and this was after they heard ‘Free Bird’, ‘Simple Man’ and ‘Gimme Three Steps’”. Ironic then that, in creating the Southern Idiom that would define Skynyrd, Van Zant and the band had to move away from the Muscle Shoals environment that they laud in the song. There is though an interesting Muscle Shoals contribution to the song, and it is, perhaps, the point that saves the song both musically and politically. It’s a voice, and a voice that is rarely mentioned in the same breath as the song. It’s the voice of Merry Clayton. In 1970 Clayton had already established herself as one of the finest backing vocalists in the business, to the point where she came centre stage with the Rolling Stones when they recorded the song Gimme Shelter in Muscle Shoals. That song with all its danger and menace would have sounded like a nursery ryhme were it not for Clayton’s huge soulful vocals. She appeared on records by Neil Young, The Beach Boys, Barbara Streisand, BB King, the Stones, and Neil Diamond. She had also released her own album of cover versions, including a superb version of Neil Young’s Southern Man. Clayton, though, ignored here initial gut instinct to pass up on the session, and instead took to the session with gusto, using that brief space in the background to make her voice heard as a protest: “A-ha, sweet home alabama – we got your sweet home alabama, but we’re goin to sing you anyway, and we’re going to sing the crap out of you”, and that’s exactly what she did. Once you’ve picked Clayton’s voice out in the background it’s impossible to hear the song in the same way ever again. Mark Kemp summed things up well in his book Dixie Lullaby when he wrote: “Those of us who have characterized [Van Zant] as a misunderstood liberal, have done so only to placate our own irrational feelings of shame for responding to the passion in his music.” In the end Skynyrd’s indifference and opportunism alone dismiss any defense of their good intentions with the song – but great songs rise above ugly intentions, and Sweet Home Alabama deserves to be listened to with a critical and attentive ear. Beneath the redneck rumble and tumbling there’s a slice of American History to be discovered.